Is that a black eye? While Sharapova’s quarter was blown wide open with Kim Clijsters’ loss, American Bethanie Mattek-Sands sits on the top half of the draw and next has to deal with the always-testy Jelena Jankovic. The talk, however, has been less about BMS’ play (it’s been rather good lately) and more about her ever-famous face make-up (seen above). Everyone seems to be chatting about BMS’ face, and less about her game. Though, after her hard-fought second round win, the Times gave her this headline: “A Rising American Now Has a Game as Bold as Her Style.” Touche, folks. But what about in a few weeks’ time when BMS dons her Wimbledon players’ party Gaga-inspired dress? There will be no talk of her tennis, we predict. Or can she have her cake and eat it too? Either way, she’s happy. 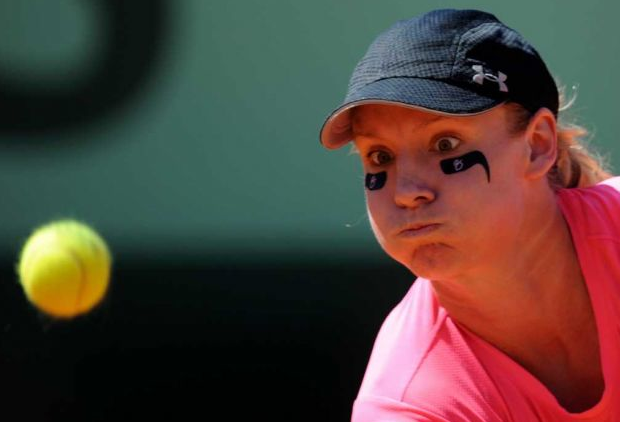 This entry was posted on May 26, 2011 at 12:00 pm and is filed under advertising, bethanie mattek-sands, fashion, maria sharapova, new york times, roland garros, wta. You can follow any responses to this entry through the RSS 2.0 feed. You can leave a response, or trackback from your own site.